Nature lovers painstakingly strings their cranberries ‘round a Christmas tree. These tart, shiny, scarlet gems, whether they are sauced, jellied or relished, are a necessary part of traditional holiday feasts. Cranberries were first nicknamed “crane berries” because cranes tramping through the cranberry bogs knew a good thing when they saw it. They gobbled up and fed on this luscious fruit. 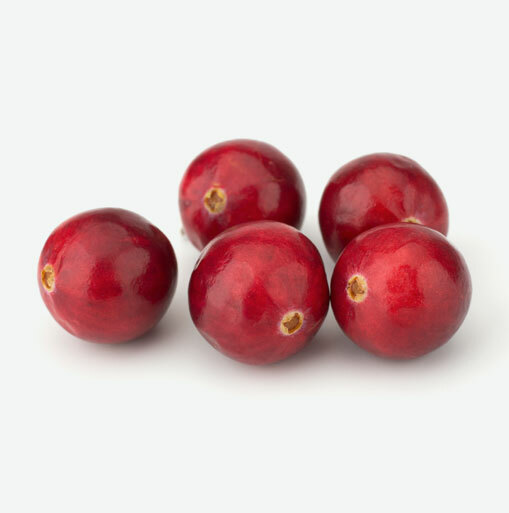 Cranberries were also once called bounce-berries because of the way the ripe fruit jumps if dropped. Cranberries are a low-growing vine native to bogs and they are a close relative of the blueberry. Did you know that Eastern Europeans believed cranberries could reduce fever and cure cancers. Cranberries are an essential part of a healthy, balanced diet. These berries are high in antioxidants and phytonutrients that can be helpful in preventing urinary tract infections, and are also beneficial for helping to prevent heart disease, cancer, stomach ulcers and periodontal gum disease. When buying cranberries look for bright, plump cranberries. Avoid soft, crushed, or shriveled berries. You’ll find cranberries available October through December, during their peak season. If refrigerated immediately, cranberries will keep for 4 weeks. Do not wash cranberries until ready for use, as moisture will cause them to spoil quicker. Cranberries are easily frozen for longer storage. Freeze cranberries, without pre-washing, in their original container and cover with plastic wrap or just throw them into a freezer bag. You can substitute frozen cranberries in most recipes that call for fresh. Cranberries are extremely tart, so they are often combined with sugar or other fruits when cooked. These ruby delights are usually cooked into a sauce used with meats at Thanksgiving and Christmas. Cranberries also make good chutneys, pies and cobblers. Dried cranberries can be used like raisins. Cranberries go well with apples, cinnamon, cloves, oranges, pears, sugar, walnuts, pine nuts and almonds.